Bosch Sensortec has developed an ultra-low power smart Inertial Measurement Unit (IMU) specifically targeted at wearable applications. It offers a strongly improved accelerometer offset and sensitivity performance, enabled by the newest Bosch MEMS process technology and simplified calibration. The BMI270 includes intuitive gesture, context and activity recognition with an integrated plug-and-play step counter, which is specially optimised for accurate step counting in wrist-worn devices. The IMU is also well suited for other types of wearable devices, such as hearables, smart clothes, smart shoes, smart glasses and ankle bands. As an ultra-low power IMU, the BMI270 significantly extends system battery life by handling multiple activity tracking, step counting and gesture recognition functions independently of the main system processor, without having to wake it up. These processor-independent functions include tasks such as sending an interrupt when a certain number of steps is reached, or geofencing to activate GPS when the user stands up and starts walking. A key point is that the gesture and activity recognition features run in the ultra-low power domain, with current consumption of just 30 μA. This noticeably reduces power consumption and users can benefit from extended battery charging intervals. "The BMI270 combines robustness, accuracy and ultra-low power consumption, making it ideal for wearables," says Dr. Stefan Finkbeiner, CEO of Bosch Sensortec. 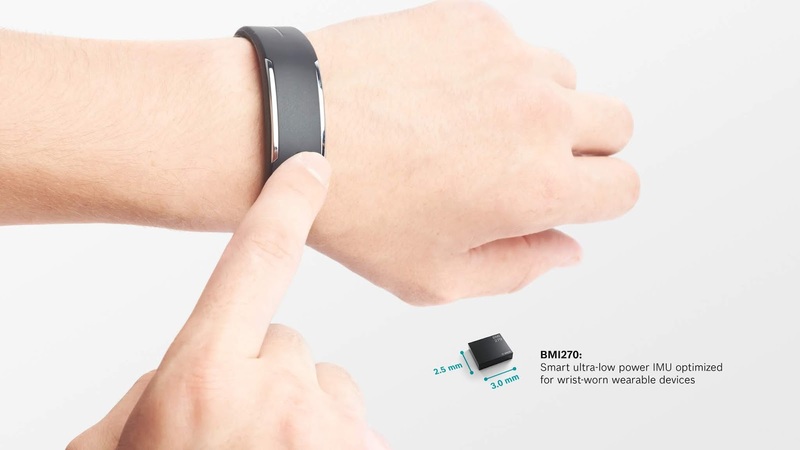 "It also features a dedicated set of functions developed for wrist-worn and other wearable devices, giving wearable manufacturers and vendors the capability to develop differentiated products with a competitive edge." The smart IMU is available in two application-specific versions. The 'gesture' version, which detects gestures including flick in/out, arm up/down, and wrist tilt. This version is fully compliant with Wear OS by Google, ensuring a user-friendly and feature-rich experience for end users. The 'context and activity' version has advanced features for recognising context activity and activity change, for example standing, walking or being in a vehicle. Embedded designers benefit from the sensor performance of the IMU and can customise it based on the specific use case with gesture and context/activity features. The sensor includes a 2 kB FIFO and the motionless Component Retrimming (CRT) that provides built-in gyroscope self-calibration without a rotation stimulus, which saves OEMs valuable time and costs during testing and manufacturing. The embedded plug and play features of the BMI270 help to substantially cut time to market. The BMI270 measures only 2.5 x 3.0 x 0.8 mm3, and is pin-to-pin compatible with the BMI160, BMI260, BMI261 and BMI263. The BMI270 will be available for distribution in the second quarter 2019.